ON THIS PAGE:You will find some basic information about this disease and the parts of the body it may affect. This is the first page of Cancer.Net’s Guide to Stomach Cancer. Use the menu to see other pages. Think of that menu as a roadmap for this complete guide. The stomach is located in the upper abdomen and plays a central role in digesting food. When food is swallowed, it is pushed down the muscular tube called the esophagus, which connects the throat with the stomach. Then, the food enters the stomach. The stomach mixes the food and releases gastric juices that help break down and digest the food. The food then moves into the small intestine for further digestion. Stomach cancer, also called gastric cancer, begins when healthy cells in the stomach become abnormal and grow out of control. A tumor can be cancerous or benign. A cancerous tumor is malignant, meaning it can grow and spread to other parts of the body. A benign tumor means the tumor can grow but will not spread. Cancer can begin in any part of the stomach. It can also spread to nearby lymph nodes and other parts of the body, such as the liver, bones, lungs, and a woman’s ovaries. Most stomach cancers are a type called adenocarcinoma. This means that the cancer started in the glandular tissue that lines the inside of the stomach. Other types of cancerous tumors that form in the stomach include lymphoma, gastric sarcoma, and neuroendocrine tumors, but these are rare. ASCO Answers Fact Sheet: Read a 1-page fact sheet that offers an introduction to stomach cancer. This free fact sheet is available as a PDF, so it is easy to print. Cancer.Net En Español: Read about stomach cancer in Spanish. Infórmase sobre cáncer de estómago en español. The next section in this guide is Statistics. It helps explain the number of people who are diagnosed with stomach cancer and general survival rates. Use the menu to choose a different section to read in this guide. ON THIS PAGE:You will find information about the number of people who are diagnosed with stomach cancer each year. You will also read general information on surviving the disease. Remember, survival rates depend on several factors. Use the menu to see other pages. This year, an estimated 27,510 (17,230 men and 10,280 women) in the United States will be diagnosed with stomach cancer. It is estimated that 11,140 deaths (6,800 men and 4,340 women) from this disease will occur this year. Stomach cancer occurs most often in older people. About 60% of people who are diagnosed are older than age 64. The average age of diagnosis is 68. The incidence of stomach cancer varies in different parts of the world. Although stomach cancer is decreasing in the United States, it is still one of the most common cancer types and one of the top causes of cancer deaths worldwide. The 5-year survival rate tells you what percent of people live at least 5 years after the cancer is found. Percent means how many out of 100. The 5-year survival rate for people with stomach cancer is 31%. This statistic reflects the fact that most people with stomach cancer are diagnosed after the cancer has already spread to other parts of the body. If stomach cancer is found before it has spread, the 5-year survival rate is generally higher but depends on the stage of the cancer found during surgery. If the cancer is diagnosed and treated before it has spread outside the stomach, the 5-year survival rate is 68%. If the cancer has spread to surrounding tissues or organs and/or the regional lymph nodes, the 5-year survival rate is 31%. If the cancer has spread to a distant part of the body, the 5-year survival rate is 5%. It is important to remember that statistics on the survival rates for people with stomach cancer are an estimate. The estimate comes from annual data based on the number of people with this cancer in the United States. Also, experts measure the survival statistics every 5 years. So the estimate may not show the results of better diagnosis or treatment available for less than 5 years. Talk with your doctor if you have any questions about this information. Learn more about understanding statistics. ON THIS PAGE:You will find a drawing of the main body parts affected by stomach cancer. Use the menu to see other pages. The next section in this guide is Risk Factors. It explains the factors that may increase the chance of developing stomach cancer. Use the menu to choose a different section to read in this guide. ON THIS PAGE: You will find out more about the factors that increase the chance of developing stomach cancer. Use the menu to see other pages. Bacteria. A common bacterium called Helicobacter pylori, also called H. pylori, causes stomach inflammation and ulcers. It is also considered one of the main causes of stomach cancer. Testing for H. pylori is available and an infection can be treated with antibiotics. Testing for H. pylori is recommended if you have had a first-degree relative, such as a parent, sibling, or child, who has been diagnosed with stomach cancer or an H. pylori infection. Other family members could have it as well, and the infection should be treated if found. Family history/genetics. People who have a parent, child, or sibling who has had stomach cancer have a higher risk of the disease. In addition, certain inherited genetic disorders, such as hereditary diffuse gastric cancer, Lynch syndrome, hereditary breast and ovarian cancer (HBOC), and familial adenomatous polyposis (FAP) may increase the risk of stomach cancer. Learn more about genetics and cancer. Diet. Eating a diet high in salt has been linked to an increased risk of stomach cancer. This includes foods preserved by drying, smoking, salting, or pickling and foods high in added salt. Eating fresh fruits and vegetables may help lower the risk. Previous surgery or health conditions. People who have had stomach surgery, pernicious anemia, or achlorhydria have a higher risk of stomach cancer. Pernicious anemia is a severe decrease in red blood cells caused when the stomach is not able to properly absorb vitamin B12. Achlorhydria is a lack of hydrochloric acid in the gastric juices, which help digest food. Tobacco and alcohol. Tobacco use and drinking a lot of alcohol may increase the risk of developing stomach cancer. Obesity. Excess body weight increases a man’s risk of developing stomach cancer. It is not clear whether obesity increases a woman’s risk of stomach cancer. The next section in this guide is Symptoms and Signs. It explains the body changes or medical problems that stomach cancer can cause. Use the menu to choose a different section to read in this guide. People with stomach cancer may experience the following symptoms or signs. Sometimes, people with stomach cancer do not have any of these changes. Or, the cause may be a different medical condition that is not cancer. Stomach cancer is usually not found at an early stage because it often does not cause specific symptoms. When symptoms do occur, they may be vague and can include those listed below. It is important to remember that these symptoms can also be caused by many other illnesses, such as a stomach virus or an ulcer. If cancer is diagnosed, relieving symptoms remains an important part of cancer care and treatment. It is often started soon after diagnosis and continued throughout treatment. This may be called palliative care or supportive care. Be sure to talk with your health care team about the symptoms you experience, including any new symptoms or a change in symptoms. ON THIS PAGE:You will find a list of common tests, procedures, and scans that doctors use to find the cause of a medical problem. Use the menu to see other pages. For stomach cancer, testing may be done for PD-L1 and high microsatellite instability (MSI-H), which may also be called a mismatch repair deficiency. The results of these tests help doctors find out if immunotherapy is a treatment option (see Types of Treatment). Endoscopy. An endoscopy allows the doctor to see the inside of the body with a thin, lighted, flexible tube called a gastroscope or endoscope. The person may be sedated as the tube is inserted through the mouth, down the esophagus, and into the stomach and small bowel. Sedation is giving medication to become more relaxed, calm, or sleepy. The doctor can remove a sample of tissue as a biopsy during an endoscopy and check it for signs of cancer. Endoscopic ultrasound. This test is similar to an endoscopy, but the gastroscope has a small ultrasound probe on the end. An ultrasound uses sound waves to create a picture of the internal organs. An ultrasound image of the stomach wall helps doctors determine how far the cancer has spread into the stomach and nearby lymph nodes, tissue, and organs, such as the liver or adrenal glands. Barium swallow. In a barium swallow, a person swallows a liquid containing barium, and a series of x-rays are taken. Barium coats the lining of the esophagus, stomach, and intestines, so tumors or other abnormalities are easier to see on the x-ray. Computed tomography (CT or CAT) scan. A CT scan takes pictures of the inside of the body using x-rays taken from different angles. A computer combines these pictures into a detailed, 3-dimensional image that shows any abnormalities or tumors. A CT scan can be used to measure the tumor’s size. Sometimes, a special dye called a contrast medium is given before the scan to provide better detail on the image. This dye is usually given both as a liquid to swallow and an injection into a patient's vein. Magnetic resonance imaging (MRI). An MRI uses magnetic fields, not x-rays, to produce detailed images of the body. MRI can be used to measure the tumor’s size. A special dye called a contrast medium is given before the scan to create a clearer picture. This dye is usually injected into a patient’s vein. Laparoscopy. A laparoscopy is a minor surgery in which the surgeon inserts a thin, lighted, flexible tube called a laparoscope into the abdominal cavity. It is used to find out if the cancer has spread to the lining of the abdominal cavity or liver. A CT or PET scan cannot often find cancer that has spread to these areas. ON THIS PAGE:You will learn about how doctors describe a cancer’s growth or spread. This is called the stage. Use the menu to see other pages. Staging is a way of describing where the cancer is located, if or where it has spread, and whether it is affecting other parts of the body. Doctors use diagnostic tests to find out the cancer's stage, so staging may not be complete until all of the tests are finished. Knowing the stage helps the doctor to decide what kind of treatment is best and can help predict a patient's prognosis, which is the chance of recovery. There are different stage descriptions for different types of cancer. This section covers staging of adenocarcinoma, the most common type of stomach cancer. Staging is different for gastric lymphoma, sarcoma, and neuroendocrine tumors. Tumor (T): How deeply has the primary tumor spread into the stomach wall? Metastasis (M): Has the cancer spread to other parts of the body? Using the TNM system, the “T” plus a letter or number (0 to 4) is used to describe the how far the tumor has grown into the stomach wall. Tumor size is measured in centimeters (cm). A centimeter is roughly equal to the width of a standard pen or pencil. T0 (T plus zero): There is no evidence of a primary tumor in the stomach. Tis: This stage describes a condition called carcinoma (cancer) in situ. The cancer is found only in cells on the surface of the inner lining of the stomach called the epithelium and has not spread to any other layers of the stomach. T1: The tumor has grown into the lamina propria, muscularis mucosae, or the submucosa, which are the inner layers of the wall of the stomach. T1a: The tumor has grown into the lamina propria or muscularis mucosae. T1b: The tumor has grown into the submucosa. T2: The tumor has grown into the muscularis propria, the muscle layer of the stomach. T3: The tumor has grown through all of the layers of the muscle into the connective tissue outside the stomach. It has not grown into the lining of the abdomen, called the peritoneal lining, or into the serosa, which is the outer layer of the stomach. T4: The tumor has grown through all of the layers of the muscle into the connective tissue outside the stomach. It has also grown into the peritoneal lining or serosa or the organs surrounding the stomach. T4a: The tumor has grown into the serosa. T4b: The tumor has grown into organs surrounding the stomach. The “N” in the TNM staging system is for lymph nodes. These tiny, bean-shaped organs help fight infection. Lymph nodes inside the abdomen are called regional lymph nodes. Lymph nodes in other parts of the body are called distant lymph nodes. The overall prognosis for patients with stomach cancer is based on how many regional lymph nodes show signs of cancer. If 2 or fewer have cancer, the prognosis is better than if more than 3 to 6 or 7 or more lymph nodes contain cancer cells. NX: Regional lymph nodes cannot be evaluated. N1: The cancer has spread to 1 to 2 regional lymph nodes. N2: The cancer has spread to 3 to 6 regional lymph nodes. N3: The cancer has spread to 7 or more regional lymph nodes. N3a: The cancer has spread to 7 to 15 regional lymph nodes. N3b: The cancer has spread to 16 or more regional lymph nodes. The “M” in the TNM system describes whether the cancer has spread to other parts of the body, called distant metastasis. M1: The cancer has spread to another part or parts of the body. Stage 0: This is also called carcinoma in situ. The cancer is found only on the surface of the epithelium. The cancer has not grown into any other layers of the stomach. This stage is considered an early cancer (Tis, N0, M0). Stage IA: The cancer has grown into the inner layer of the wall of the stomach. It has not spread to any lymph nodes or other organs (T1, N0, M0). The cancer has grown into the inner layers of the wall of the stomach. It has spread to 1 to 2 lymph nodes but not elsewhere (T1, N1, M0). The cancer has grown into the outer muscular layers of the wall of the stomach. It has not spread to the lymph nodes or other organs (T2, N0, M0). The cancer has grown into the inner layer of the wall of the stomach. It has spread to 3 to 6 lymph nodes but not elsewhere (T1, N2, M0). The cancer has grown into the outer muscular layers of the wall of the stomach. It has spread to 1 to 2 lymph nodes but not elsewhere (T2, N1, M0). The cancer has grown through all of the layers of the muscle into the connective tissue outside the stomach. It has not grown into the peritoneal lining or serosa or spread to any lymph nodes or surrounding organs (T3, N0, M0). The cancer has grown into the inner layers of the wall of the stomach. It has spread to 7 to 15 lymph nodes but not elsewhere. (T1, N3a, M0). The cancer has invaded the outer muscular layers of the wall of the stomach. It has spread to 3 to 6 lymph nodes but not elsewhere (T2, N2, M0). The cancer has grown through all of the layers of the muscle into the connective tissue outside the stomach but has not grown into the peritoneal lining or serosa. It has spread to 1 to 2 lymph nodes but not elsewhere (T3, N1, M0). The cancer has grown through all of the layers of the muscle into the connective tissue outside the stomach. It has grown into the peritoneal lining or serosa, but it has not spread to any lymph nodes or surrounding organs (T4a, N0, M0). The cancer has grown into the outer muscular layers of the stomach wall. It has spread to 7 to 15 lymph nodes but not to other organs (T2, N3a, M0). The cancer has grown through all of the layers of the muscle into the connective tissue outside the stomach but has not grown into the peritoneal lining or serosa. It has spread to 3 to 6 lymph nodes but not to other organs (T3, N2, M0). The cancer has grown through all of the layers of the muscle into the connective tissue outside the stomach. It has grown into the peritoneal lining or serosa and has spread to 1 to 2 lymph nodes but not to other organs (T4a, N1, M0). The cancer has grown through all of the layers of the muscle into the connective tissue outside the stomach and has grown into nearby organs or structures. It has not spread to any lymph nodes or distant parts of the body (T4b, N0, M0). The cancer has grown into the inner layer of the wall of the stomach or the outer muscular layers of the stomach wall. It has spread to 16 or more lymph nodes but not to distant parts of the body (T1 or T2, N3b, M0). The cancer has grown through all of the layers of the muscle into the connective tissue outside the stomach but has not grown into the peritoneal lining or serosa. It has spread to 7 to 15 lymph nodes but has not invaded any surrounding organs (T3, N3a, M0). The cancer has grown through all of the layers of the muscle into the connective tissue outside the stomach and has grown into the peritoneal lining or serosa. It has spread to 7 to 15 lymph nodes but has not spread elsewhere (T4a, N3a, M0). The cancer has grown through all of the layers of the muscle into the connective tissue outside the stomach and has grown into nearby organs or structures. It may or may not have spread to 1 to 6 lymph nodes but not to distant parts of the body (T4b, N1 or N2, M0). The cancer has grown through all of the layers of the muscle into the connective tissue outside the stomach and may have grown into the peritoneal lining or serosa. It has spread to 16 or more lymph nodes but not to distant parts of the body (T3 or T4a, N3b, M0). The cancer has grown through all of the layers of the muscle into the connective tissue outside the stomach and has grown into nearby organs or structures. It has spread to 7 or more lymph nodes but not to other parts of the body (T4b, N3a or N3b, M0). Stage IV: Stage IV stomach cancer describes a cancer of any size that has spread to distant parts of the body in addition to the area around the stomach (any T, any N, M1). Recurrent cancer: Recurrent cancer is cancer that has come back after treatment. It may be a localized recurrence, which means it has come back in the place where it started. Or it may be a distant metastasis, which means it has come back in another part of the body. If the cancer does return, there will be another round of tests to learn about the extent of the recurrence. These tests and scans are often similar to those done at the time of the original diagnosis. Stomach cancer is much more common in Japan and other parts of Asia and South America than in the United States. Japan has a different method of staging stomach cancer, based on where the lymph nodes with cancer are located around the stomach. This is different from the U.S. system, which uses the number of lymph nodes and not their location. Surgery for stomach cancer may be described using the Japanese system. The type of surgery is identified by which lymph nodes are removed in addition to the stomach. 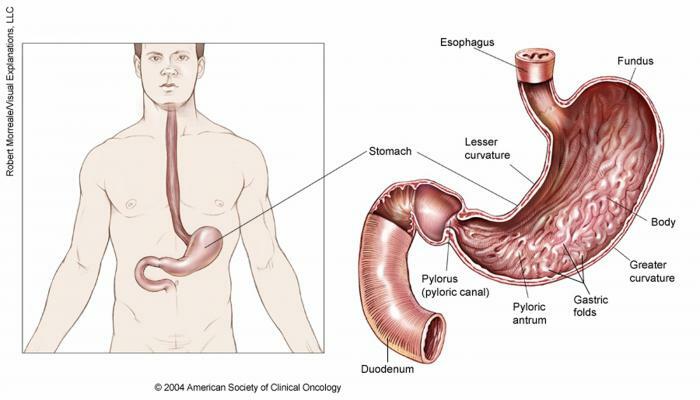 Learn more about surgery for stomach cancer in the Types of Treatment section. D0: No lymph nodes were removed. D1: The lymph nodes closest to the stomach were removed. D2: Lymph nodes from a wider area were removed. ON THIS PAGE: You will learn about the different types of treatments doctors use for people with stomach cancer. Use the menu to see other pages. This section explains the types of treatments that are the standard of care for stomach cancer. “Standard of care” means the best treatments known. When making treatment plan decisions, you are encouraged to consider clinical trials as an option. A clinical trial is a research study that tests a new approach to treatment. Doctors want to learn whether the new treatment is safe, effective, and possibly better than the standard treatment. Clinical trials can test a new drug, a new combination of standard treatments, or new doses of standard drugs or other treatments. Clinical trials are an option to consider for treatment and care for all stages of cancer. Your doctor can help you consider all your treatment options. Learn more about clinical trials in the About Clinical Trials and Latest Research sections of this guide. Stomach cancer may be treated with surgery, radiation therapy, chemotherapy, targeted therapy, or immunotherapy. Descriptions of the common types of treatments used for stomach cancer are listed below. Your care plan may also include treatment for symptoms and side effects, an important part of cancer care. Treatment options and recommendations depend on several factors, including the type and stage of cancer, possible side effects, and the patient’s preferences and overall health. Often, a combination of treatments is used for stomach cancer. It can be difficult to cure stomach cancer because it is often not found until it is at an advanced stage. Take time to learn about all of your treatment options and be sure to ask questions about things that are unclear. Talk with your doctor about the goals of each treatment and what you can expect while receiving the treatment. These types of talks are called “shared decision making.” Shared decision making is when you and your doctors work together to choose treatments that fit the goals of your care. Shared decision making is particularly important for stomach cancer because there are different treatment options. Learn more about making treatment decisions. Surgery is the removal of the tumor and some surrounding healthy tissue during an operation. The type of surgery used depends on the stage of the cancer (see Stages). For a very early stage (T1a) cancer, some doctors may recommend a non-surgical treatment called an endoscopic mucosal resection. This is the removal of the tumor with an endoscope (see Diagnosis). In early stages (stages 0 or I), when the cancer is still only in the stomach, surgery is used to remove the part of the stomach with cancer and nearby lymph nodes. This is called a subtotal or partial gastrectomy. In a partial gastrectomy, the surgeon connects the remaining part of the stomach to the esophagus or small intestine. If the cancer has spread to the outer stomach wall with or without having spread to the lymph nodes, surgery plus chemotherapy or chemotherapy and radiation therapy may be used (see below). The surgeon can perform a subtotal gastrectomy or a total gastrectomy, which is the removal of all of the stomach. During a total gastrectomy, the surgeon attaches the esophagus directly to the small intestine. Gastrectomy is a major surgery and can have serious side effects. After this surgery, the patient will only be able to eat a small amount of food at a time. A common side effect is a group of symptoms called "dumping syndrome," which includes cramps, nausea, diarrhea, and dizziness after eating. This happens when food enters the small intestine too fast. The doctor can suggest ways to avoid this and can prescribe medication to help control these symptoms. The symptoms usually lessen or disappear in a few months, but they may be permanent for some people. Patients who have had their entire stomach removed may need regular injections of vitamin B12 because they may no longer be able to absorb this essential vitamin through their stomach. Before surgery, talk with your health care team about the possible side effects from the specific surgery you will have. Regional lymph nodes are often removed during surgery because the cancer may have spread to those lymph nodes. This is called a lymphadenectomy. There is still debate as to how many lymph nodes should be removed. In Europe and especially in Japan, more lymph nodes are removed than in the United States. When the cancer is diagnosed as Stage IV, surgery is typically not recommended as the main treatment (see Metastatic stomach cancer, below). Other types of treatment will be recommended instead. Radiation therapy is the use of high-energy x-rays or other particles to destroy cancer cells. A radiation therapy regimen, or schedule, usually consists of a specific number of treatments given over a set period of time. People with stomach cancer usually receive external-beam radiation therapy, which is radiation given from a machine outside the body. Radiation therapy may be used before surgery to shrink the size of the tumor or after surgery to destroy any remaining cancer cells. Side effects from radiation therapy include fatigue, mild skin reactions, upset stomach, and loose bowel movements. Most side effects go away soon after treatment is finished. Talk with your radiation oncologist about the possible side effects you may experience and your recovery period. Each of these types of therapies are discussed below in more detail. A person may receive 1 type of systemic therapy at a time or a combination of systemic therapies given at the same time. They can also be given as part of a treatment plan that includes surgery and/or radiation therapy. HER2-targeted therapy. Some cancers may make too much of a protein called human epidermal growth factor receptor 2 (HER2). This type of cancer is called HER2-positive cancer. Trastuzumab (Herceptin, Herzuma, Ogivri, Ontruzant) plus chemotherapy may be an option for patients with later-stage HER2-positive stomach cancer. Anti-angiogenesis therapy. Anti-angiogenesis therapy is focused on stopping angiogenesis, which is the process of making new blood vessels. Because a tumor needs the nutrients delivered by blood vessels to grow and spread, the goal of anti-angiogenesis therapies is to “starve” the tumor. For patients whose tumor has grown while receiving initial chemotherapy, the drug ramucirumab (Cyramza) may be an additional option. For patients with advanced stomach cancer that has PD-L1 or is MSI-H (see Diagnosis), pembrolizumab (Keytruda) may be an option for patients when chemotherapy does not work. If cancer spreads to another part in the body from where it started, doctors call it metastatic cancer (stage IV in the Stages section). If this happens, it is a good idea to talk with doctors who have experience in treating it. Doctors can have different opinions about the best standard treatment plan. Clinical trials might also be an option. Learn more about getting a second opinion before starting treatment, so you are comfortable with your chosen treatment plan. The goal of treatment at this stage is typically to lengthen a patient’s life and care for the symptoms of the cancer since metastatic stomach cancer is not considered curable. Any treatment, including chemotherapy or radiation therapy, is considered palliative therapy. Surgery is rarely used, and the main treatment is usually chemotherapy. It is important to note that studies show that the use of palliative chemotherapy for stomach cancer can improve both the length and quality of life. Given the inability to cure metastatic stomach cancer, this diagnosis is stressful and at times, difficult to bear. You and your family are encouraged to talk about how you feel with doctors, nurses, social workers, or other members of the health care team. It may also be helpful to talk with other patients, including through a support group. When this occurs, a new cycle of testing will begin again to learn as much as possible about the recurrence. After this testing is done, you and your doctor will talk about the treatment options. Often the treatment plan will include the treatments described above such as surgery, chemotherapy, and radiation therapy, but they may be used in a different combination or given at a different pace. Your doctor may suggest clinical trials that are studying new ways to treat this type of recurrent cancer. Whichever treatment plan you choose, palliative care will be important for relieving symptoms and side effects. Doctors and scientists are always looking for better ways to care for people with stomach cancer. To make scientific advances, doctors create research studies involving volunteers, called clinical trials. In fact, every drug that is now approved by the U.S. Food and Drug Administration (FDA) was tested in clinical trials. Clinical trials are used for all types and stages of stomach cancer. Many focus on new treatments to learn if a new treatment is safe, effective, and possibly better than the existing treatments. These types of studies evaluate new drugs, different combinations of treatments, new approaches to radiation therapy or surgery, and new methods of treatment. People who participate in clinical trials can be some of the first to get a treatment before it is available to the public. However, there are some risks with a clinical trial, including possible side effects and the chance that the new treatment may not work. People are encouraged to talk with their health care team about the pros and cons of joining a specific study. People decide to participate in clinical trials for many reasons. For some people, a clinical trial is the best treatment option available. Because standard treatments are not perfect, people are often willing to face the added uncertainty of a clinical trial in the hope of a better result. Other people volunteer for clinical trials because they know that these studies are a way to contribute to the progress in treating stomach cancer. Even if they do not benefit directly from the clinical trial, their participation may benefit future patients with stomach cancer. Insurance coverage and the costs of clinical trials differ by location and by study. In some programs, some of the expenses from participating in the clinical trial are reimbursed. In others, they are not. It is important to talk with the research team and your insurance company first to learn if and how your treatment in a clinical trial will be covered. Learn more about health insurance coverage of clinical trials. Sometimes people have concerns that, in a clinical trial, they may receive no treatment by being given a placebo or a “sugar pill.” When used, placebos are usually combined with standard treatment in most cancer clinical trials. When a placebo is used in a study, it is done with the full knowledge of the participants. Find out more about placebos in cancer clinical trials. People who participate in a clinical trial may stop participating at any time for personal or medical reasons. This may include that the new treatment is not working or there are serious side effects. Clinical trials are also closely monitored by experts who watch for any problems with each study. It is important that people participating in a clinical trial talk with their doctor and researchers about who will be providing their treatment and care during the clinical trial, after the clinical trial ends, and/or if they choose to leave the clinical trial before it ends. Research through clinical trials is ongoing for all types of cancer. For specific topics being studied for stomach cancer, learn more in the Latest Research section. In addition, you can find a free video-based educational program about cancer clinical trials in another section of this website. The next section in this guide is Latest Research. It explains areas of scientific research for stomach cancer. Use the menu to choose a different section to read in this guide. Doctors are working to learn more about stomach cancer, ways to prevent it, how to best treat it, and how to provide the best care to people diagnosed with this disease. The following areas of research may include new options for patients through clinical trials. Always talk with your doctor about the best diagnostic and treatment options for you. Chemoprevention. Chemoprevention is the use of drugs or nutrients to lower a person’s risk of developing cancer. Early research suggests that using antibiotics to treat H. pylori infections (see Risk Factors) can prevent changes to stomach cells that may lead to cancer. Combination therapy. The combination of chemotherapy, radiation therapy, and surgery may reduce the chance that stomach cancer will return. Doctors may give chemotherapy before surgery, called neoadjuvant therapy, or after surgery, called adjuvant therapy. In addition, doctors may also combine radiation therapy and chemotherapy after surgery. Doctors are also looking at giving both radiation therapy and chemotherapy before surgery. Newer chemotherapy treatments. Chemotherapy with multiple combinations of drugs is being increasingly used for people with stomach cancer. Drug combinations work slightly better than single drugs. As outlined in the Types of Treatment section, drugs such as 5-FU, paclitaxel, docetaxel, irinotecan, oxaliplatin, as well as oral medications such as capecitabine are being studied in combination with other types of chemotherapy. Molecular testing of the tumor. Researchers are looking at the genetic changes in tumor cells to identify specific genes, proteins, and other factors unique to the tumor. Patients with different types of tumors with the same genetic change are able to participate in clinical trials, called “basket trials”, with the goal of finding treatments that target that genetic change. Targeted therapy. Previous research has shown that several types of targeted therapy do not work well for stomach cancer. These include drugs that target the gene c-MET, bevacizumab (Avastin, Mvasi), and drugs that block epidermal growth factor receptor (EGFR). However, research continues on this type of treatment approach (see Molecular testing of the tumor, above). Immunotherapy. Immunotherapy is an expanding area of research for stomach cancer. Researchers are looking at different types of immunotherapy that block the CTLA4 and/or PD-1 pathways. A tumor can use these pathways to hide from the body’s immune system. Immunotherapy that blocks these pathways allow the immune system to identify and destroy the cancer. Palliative care/supportive care. Clinical trials are underway to find better ways of reducing symptoms and side effects of current stomach cancer treatments to improve comfort and quality of life for patients. Visit the Cancer.Net Blog to review research announced at recent scientific meetings or in ASCO's peer-reviewed journals. ON THIS PAGE: You will learn more about coping with the physical, emotional, social, and financial effects of cancer and its treatment. Use the menu to see other pages. Common physical side effects from each treatment option for stomach cancer are listed in the Types of Treatment section. Learn more about side effects of cancer and its treatment, along with ways to prevent or control them. Changes to your physical health depend on several factors, including the cancer’s stage, the length and dose of treatment, and your general health. Talk with your health care team regularly about how you are feeling. It is important to let them know about any new side effects or changes in existing side effects. If they know how you are feeling, they can find ways to relieve or manage your side effects to help you feel more comfortable and potentially keep any side effects from worsening. You may find it helpful to keep track of your side effects so it is easier to explain any changes with your health care team. Learn more about why tracking side effects is helpful. You can have emotional and social effects as well as physical effects after a cancer diagnosis. This may include dealing with difficult emotions, such as sadness, anxiety, or anger, or managing your stress level. Sometimes, people find it difficult to express how they feel to their loved ones. Some have found that talking to an oncology social worker, counselor, or member of the clergy can help them develop more effective ways of coping and talking about cancer. Family members and friends often play an important role in taking care of a person with stomach cancer. This is called being a caregiver. Caregivers can provide physical, practical, and emotional support to the patient, even if they live far away. Also, ask how much care you may need at home and with daily tasks during and after treatment. This can help you make a caregiving plan. Create a caregiving plan with this 1-page fact sheet that includes an action plan to help make caregiving a team effort. This free fact sheet is available as a PDF, so it is easy to print out. Cancer.Net Mobile: The free Cancer.Net mobile app allows you to securely record the time and severity of symptoms and side effects. ASCO Answers Managing Pain: Get this 36-page booklet about the importance of pain relief that includes a pain tracking sheet to help patients record how pain affects them. The free booklet is available as a PDF, so it is easy to print out. ASCO Answers Fact Sheets: Read 1-page fact sheets on diarrhea and rash that provide a tracking sheet to record the timing and severity of the side effect. These free fact sheets are available as a PDF, so they are easy to print out. Your follow-up care may include regular physical examinations, medical tests, or both. Doctors want to keep track of your recovery in the months and years ahead. People who have had their entire stomach removed can feed themselves, but it is important for them to re-learn how to eat after this major surgery. Talk with your doctor about this type of rehabilitation. Learn more about the importance of follow-up care. A goal of follow-up care is to check for a recurrence, which means that the cancer has come back. Cancer recurs because small areas of cancer cells may remain undetected in the body. Over time, these cells may increase in number until they show up on test results or cause signs or symptoms. During follow-up care, a doctor familiar with your medical history can give you personalized information about your risk of recurrence. Your doctor will ask specific questions about your health. Some people may have blood tests or imaging tests done as part of regular follow-up care, but testing recommendations depend on several factors, including the type and stage of cancer originally diagnosed and the types of treatment given. For many people, survivorship serves as a strong motivator to make lifestyle changes. People recovering from stomach cancer are encouraged to follow established guidelines for good health, such as not smoking, limiting alcohol, eating well, and managing stress. Regular physical activity can help rebuild your strength and energy level. Your health care team can help you create an appropriate exercise plan based upon your needs, physical abilities, and fitness level. Learn more about making healthy lifestyle choices. Cancer.Net Patient Education Video: View a short video led by an ASCO expert that provides information about what comes after finishing treatment. What is my diagnosis? What does this mean? How will this treatment affect my daily life? Will I be able to work, exercise, and perform my usual activities? Will my eating habits need to change? ON THIS PAGE:You will find some helpful links to other areas of Cancer.Net that provide information about cancer care and treatment. This is the final page of Cancer.Net’s Guide to Stomach Cancer. Use the menu to go back and see other pages. This is the end of Cancer.Net’s Guide to Stomach Cancer. Use the menu to choose a different section to read in this guide.